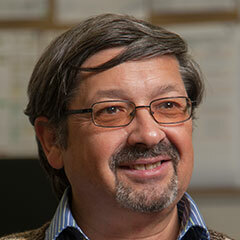 Prof. Mike Kaminski is a Full Professor at the Department of Geosciences. He started his prolific academic career in 1979, graduating with a B.S. degree in Geology from Rutgers University, New Brunswick N.J., USA. He did his masters degree in Geology at the Jagiellonian University in Krakow Poland. In 1987, he was awarded his Ph.D. in the subject of Oceanography from the W.H.O.I./M.I.T. Joint Program in the USA. In 2007, he defended his “Habilitation” thesis at the Polish Academy of Science. His research, projects and teaching experience spans nearly 30 years and his recognition within the academic world bring significant recognition to KFUPM. Dr. Kaminski is fluent in English and Polish and holds a Visiting Professorship at the AGH University of Science & Technology in Krakow. He has authored over 200 scientific publications and is a member of the editorial boards of several academic journals, including Micropaleontology, the Revue de Micropaleontologie, Geological Quarterly, and the Grzybowski Foundation Special Publications. He has supervised over 60 graduate students. Ph.D., Oceanography, W.H.O.L, MIT Joint Program, USA, 1987. M.S., Geology, Jagiellonian University, Poland, 1981. B.A., Geology, Rutgers University, USA, 1979. B.A., Slavic Studies, Rutgers University, USA, 1979. Historical Geology, Paleontology, Paleoceanography, Paleoclimatology. Biochronology of marine microfossils and calibration to the Geomagnetic Polarity Time Scale. Biostratigraphy & paleoceanography of the North Atlantic and its marginal seas. Problems in Tethyan Paleobiogeography and stratigraphic correlation. The evolution of Cretaceous-Cenozoic climate and the timescales of Global Change. The use of benthic foraminiferal assemblages for paleoenvironmental analysis. The development of the general circulation of the Atlantic Ocean from the Late Cretaceous to the Recent. Kaminski, M.A., 1985. Evidence for control of abyssal agglutinated foraminiferal community structure by substrate disturbance. Marine Geology, 66, 113-131. Kaminski, M.A., Gradstein, F.M. & Berggren, W.A., 1989. Paleogene benthic foraminiferal stratigraphy and paleoecology at Site 647, southern Labrador Sea. In: S.P. Srivastava, M.A. Arthur and B. Clement, et al., Proc. ODP, Sci. Results, 105, College Station, TX (Ocean Drilling Program), 705-730. Kaminski, M.A., Baumgartner, P.O., Bown, P., Haig, K., McMinn, A., Moran, M.J., Mutterlose, J., & Ogg, J., 1992. Magnetobiostratigraphic synthesis of Ocean Drilling Program Leg 123: Sites 765 and 766 (Argo Abyssal Plain and lower Exmouth Plateau). In: Ludden, J., Gradstein, F.M., et al. Proc. Sci. Results ODP 123, (College Station, TX), 717-737. Kaminski, M.A., Kuhnt, W. & Radley, J., 1996. Paleocene-Eocene deep water agglutinated foraminifera from the Numidian Flysch (Rif, Northern Morocco): their significance for the Paleoceanography of the Gibraltar Seaway. Journal of Micropalaeontology, 15, 1-19. Kaminski, M.A., Kuhnt, W. & Moullade, M. 1999. The evolution and paleobiogeography of abyssal agglutinated foraminifera since the Early Cretaceous: a tale of four faunas. Neues Jahrbuch für Geologie und Paläontologie Abhandlungen, 212 (1-3), 401-439. Kaminski, M.A. Aksu, A.E., Box, M., Hiscott, R.N., Filipescu, S. & Al-Salameen, M. 2002. Late Glacial to Holocene benthic foraminifera in the Marmara Sea: Implications for the Black Sea – Mediterranean Sea connections following the last deglaciation. Marine Geology, 190, 165-202. Kaminski, M.A. & Gradstein, F.M. 2005. Atlas of Paleogene cosmopolitan deep-water agglutinated foraminifera. Grzybowski Foundation Special Publication, 10, 547 pp. Kender, S., Kaminski, M.A., & Jones, R.W. 2008. Early to Middle Miocene Foraminifera from the deep-sea Congo Fan, offshore Angola. Micropaleontology, 55 (6), 477-568. Kaminski, M.A., Setoyama, E. & Cetean, C.G. 2010. The Phanerozoic diversity of Agglutinated Foraminifera: Origination and Extinction rates. Acta Paleontologia Polonica, 55 (3), 529-539. Kender, S. & Kaminski, M.A. 2013. Arctic Ocean benthic foraminiferal faunal change associated with the onset of perennial sea ice in the Middle Miocene. Journal of Foraminiferal Research, 43 (1), 99-109. Kaminski, M.A. 2014. The year 2010 classification of the agglutinated foraminifera. Micropaleontology, 61 (1), 89-108. Stein, R., Fahl, K., Schreck, M., Knorr, G., Niessen, F., Forwick, M., Gebhardt, C., Jensen, L., Kaminski, M., Kopf, A., Matthiessen, J., Jokat, W., Lohmann, G. 2016. Evidence for ice-free summers in the late Miocene central Arctic Ocean. Nature Communications, 7, 11148. Kaminski, M.A. & Alegret, L. (eds), 2017. Proceedings of the Ninth International Workshop on Agglutinated Foraminifera. Grzybowski Foundation Special Publication, 22, 264 pp.